Picture yourself among some of the world’s most exotic creatures. Come close with giraffes, gazelles, zebras and many of the other 600 animals that inhabit the preserve. Take an exciting three hour, safari drive and explore the wildlife preserve, traveling first in an authentic safari vehicle and then a trek around the inner grounds. It may not be Africa, but it’s close! With animals roaming and running free outside your safari jeep this safari escape is the closest it comes without requiring a passport. 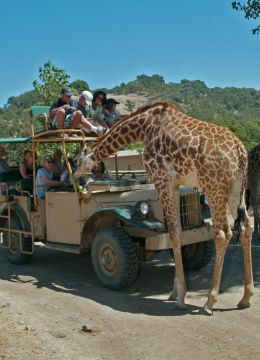 The wildlife park is designed to give the animals the ability to interact and roam about freely, as well as engage our guests in a once in a life time experience — an African luxury safari in the wine country. Our on-site restaurant, the Savannah Cafe, featuring the elegant Elephant Room, offers scrumptious safari ranch style BBQ meals. And, for a quick refueling between adventures, check out the deli delights at Delilah’s. Either way you go, the food is delicious!